The “Thank You” game is pretty simple, yet it’s a great way to teach gratitude. All you need to do is take turns with your toddler to give things to one another. Every time you give an item to your toddler, they say “thank you” and you do the same when they give you something. This is a great gratitude lesson for even younger toddlers. It’s worth pointing out here that toddlers are a little young to fully grasp the concept of gratitude. However, it’s still a great time to start developing their skills and thought patterns. Other ways to teach gratitude to your toddler include talking to them about the things you’re grateful for. When your toddler is three years old, they’ll also be able to show their gratitude more. You can then start to give them ideas on the ways they can show gratitude. Generosity is another great trait to teach your toddler. Similar to gratitude, generosity is actually pretty simple to teach. Focus on teaching your toddler to share, as well as give to others. A good idea is to bake a batch of cupcakes and then take half of them over to a neighbor. At first, your toddler may be a little shy, but don’t worry this is completely normal. The more they learn to how gratitude, the more confident they’ll become. You can also teach them to share their toys and treats, though again this could take a little time and they’re likely to be very reluctant to share to start with. The key is to be patient and persistent, your little one will slowly start to develop the skills required to be generous. Tying in with gratitude, teaching your toddler to give really helps to build their politeness skills. As they give you something and they hear you say “Thank You”, your toddler will start to learn about polite responses. They naturally copy what they see and hear, so if you’re polite, they’ll tend to follow suit. This may sound a little strange, but yoga can do wonders for toddlers. Sure, they’re not going to be learning advanced moves anytime soon, but the gentle poses help to build your toddlers peacefulness skills. Breathing deeply is also an essential life skill that’s going to aid in your little one’s life. Put on gentle music and sit with your toddler as you teach them how to take long, slow, deep breaths. Out of all of the lessons listed, this is potentially one of the most challenging. Toddlers aren’t exactly renowned for their ability to sit still so it’s definitely best to keep these deep breathing exercises short and simple. The peacefulness your toddler will develop through yoga and deep breathing will last way into adulthood. Yoga also helps your toddler with coordination and concentration. Another thing which doesn’t come naturally to toddlers is gentleness. They aren’t fully aware of their own strength and how some things are more delicate than others. So, to build up their gentleness skills, it’s a good idea to start giving them delicate objects. Explain when you give them the object, that they need to be gentle. Don’t just tell them, show them how to gently handle the object. You can also explain how some people are delicate and need to be handled gently, such as babies or the elderly. Some toddlers are much more fearless than others. If your little one is a little shy, courage building exercises can really help. It could be getting them to try out a new activity which tests their courage such as going to somewhere new, or petting a friends pet that they’ve never seen before. Keep in mind that it’s important not to push your toddler into doing something new. Encouragement is great, but if you push too hard you could actually make the fear worse. This could lead to issues trying to get them to take part in new things in the future. On the other hand, if they try something new in their own pace and they enjoy it, they’ll learn to trust you and develop more confidence in their own abilities. The more courage-building exercises you can get your toddler to try out, the more confident they’ll become. Why not ask them if there’s anything they’d like to try out that they’ve been scared of. Of course, this depends upon the age of your toddler as younger children may not be able to answer that question. 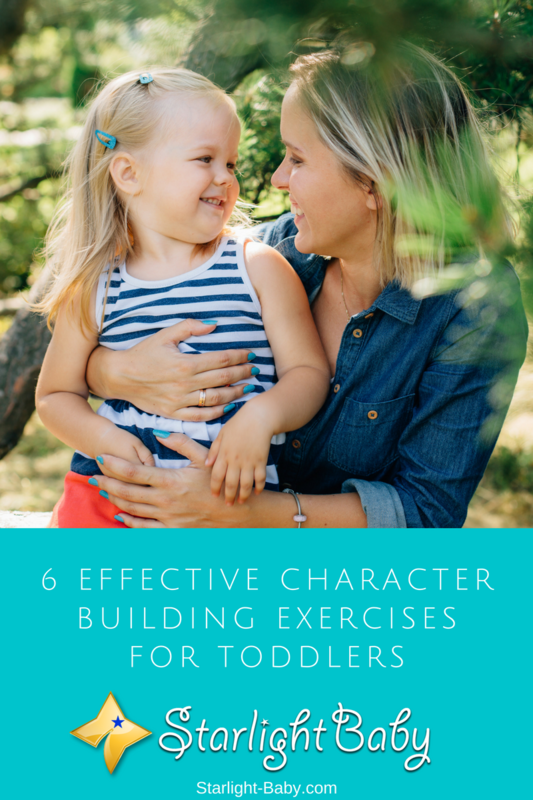 The above are just some of the ways you can build your toddlers character. Remember, whichever lesson you’re trying to teach them, you should always keep it short. Patience isn’t something you can really teach at this age and toddlers do have very short attention spans. You’ll also want to try and make the exercises as fun as possible. If your little one enjoys the character building exercises, they’ll be more likely to want to continue with them. them self and the people around them. Yes, I do believe those are some of the lessons a child can learn from the Thank You game. Knowing how to show gratitude also means you value and respect yourself because I don’t think a person who doesn’t have self-respect will respect others. Building the characters of the toddlers can be an essential way to ensure they build better ways to relate with others. The act of showing gratitude is one key character that we need to build in them. True! I do believe knowing how to show gratitude is a very basic trait any person should have. I would say this is often one of the first things we teach kids, to say “Thank you” when they are given something. I am looking forward to trying these for my baby boy who will have his first birthday in May. He is 10 months now and he is already standing by holding a support. My parenting journey has been an amazing experience. I am gaining a lot of tips on this blog. I’ll be glad to see you help your little one to become a better man in the society. I always say that there evils that is happening in our society has been as a result of the parents not doing enough to mould the character of their children right from a young and that’s the reason I find this particular article one of the best that I’ve read here. I totally agree with you on that, Henrywrites. Parents’ failure to instill values in their kids at a young age will make them grow up to become societal problems – disrespectful, undisciplined, etc. Parents should never underestimate their role in building the kind of society/world we live in. He is still tender but I’m sure that in no distant time he would be able do so a lot of these things discussed on this article and they are definitely going to aid him with building a good character that would benefit both the parents and his immediate family. There is this religious saying that should you teach a child the ways he or she should grow up with and they would hardly depart from it. If as a parent you started inculcating good characters in your toddler, they are definitely going to grow up being a source of joy to you. Teaching them to show gratitude by saying thank you and also learning to be generous would mold them into fine individuals. Hi I find this very interesting. Specially now that I have an energetic toddler. I agree with this “to build up their gentleness skills, it’s a good idea to start giving them delicate objects…” I really think that making them feel that you trust them even as a kid will boost up their confidence and this can help in building a better character in the future. Yes, I agree with trusting kids to boost their confidence. If we are overprotective and see them as helpless beings, they will not grow to become responsible adults. Children love to feel independent and do things by themselves so let them. Just be sure you are always around them to ‘rescue’ them in case they fall, trip, etc. Wow! We’re really glad this article gave you the information you’ve been looking for.